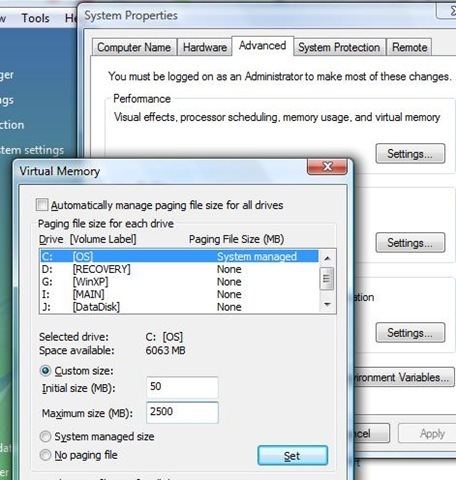 If you receive an error messages that warns you about low virtual memory, it means that you have so many programs running at the same time and your temporary space in your hardisk called paging file is not enough. 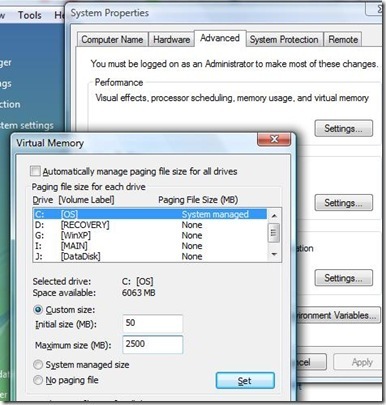 Virtual memory is use to compensate if your RAM is not enough. If you have a budget increase your Random Access Memory (RAM) memory, which is better. Or increase your paging file size. Press windows key+Pause/break-->Advance System Settings --> Advanced Tab-->Performance(Settings)-->Advanced Tab--> Virtual Memory(Change). Uncheck the "Automatically manage paging file size", and select 'Custom Size'. Increased the size based on the Recommended levels+200mb or more. Example: For me, the recommended level is 2289 I increased it to 2500 because currently I have no problem on virtual memory, but I do recommend 2800mb-3000mb. The maximum size of virtual memory is 3xRAM, and it is better if your hardisk is 7200rpm for better Windows Vista performance.